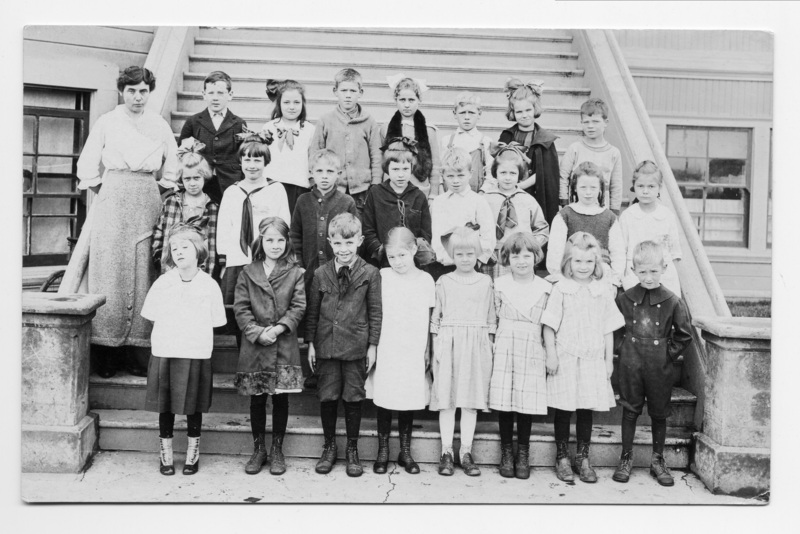 October 1920 - 2nd grade; Miss Irma Vose - teacher. 1st row l to r: __, __, Price Burlingame; __; Josie Pollard, _- Eunice Weedman, ___; Larson. 2nd row: __; Roma Confer, __, __, __Fox, Ava Bickner, __, Wanda Davidson. 3rd row: Bill Wanker, Constance Koehler, Norman (?) Baker, __, __, __,__. Description Sepia but scanned as B & W; Same as 352b & c, but names different on the back. Transcription October 1920 - 2nd grade; Miss Irma Vose - teacher. 1st row l to r: __, __, Price Burlingame; __; Josie Pollard, _- Eunice Weedman, ___; Larson. 2nd row: __; Roma Confer, __, __, __Fox, Ava Bickner, __, Wanda Davidson. 3rd row: Bill Wanker, Constance Koehler, Norman (?) Baker, __, __, __,__.